Many of the small details of planning your West Highland Way walk can end up being the biggest challenges. You probably know that climbing the Devil’s Staircase will be difficult, but you might not be thinking as much about how you’ll get from the finish in Fort William to your hotel in Glasgow. We’ve put together the following post to help you tackle all of those tricky logistical items that are sure to arise when you’re planning your own West Highland Way adventure. Enjoy! Milngavie and the start of the West Highland Way are easily reached from Glasgow. Most international travelers will arrive at the Glasgow Airport prior to starting their walk, while those from the UK will likely arrive at the Glasgow Queen Street Station or Glasgow Central Station (the two main train stations). For those arriving at the airport there is frequent and convenient bus service from the Glasgow Airport to central Glasgow via the Glasgow Airport Express. The service runs 24 hours per day and takes approximately 25 minutes to get from the airport to central Glasgow. If you have a contactless credit/debit card, you can pay your fare right on the bus. Otherwise, you can pay with cash on the bus or purchase a ticket online beforehand. 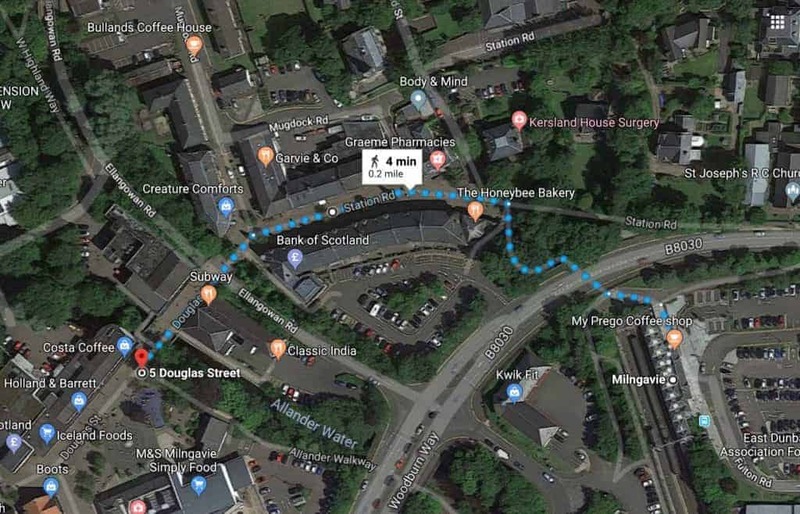 If you’re spending the night in central Glasgow after your flight or planning to head to Milngavie from Queen Street Station, you’ll want to get off the bus at the ‘Dundas Street’ stop. There is frequent train service to Milngavie from Glasgow’s Queen Street Station. 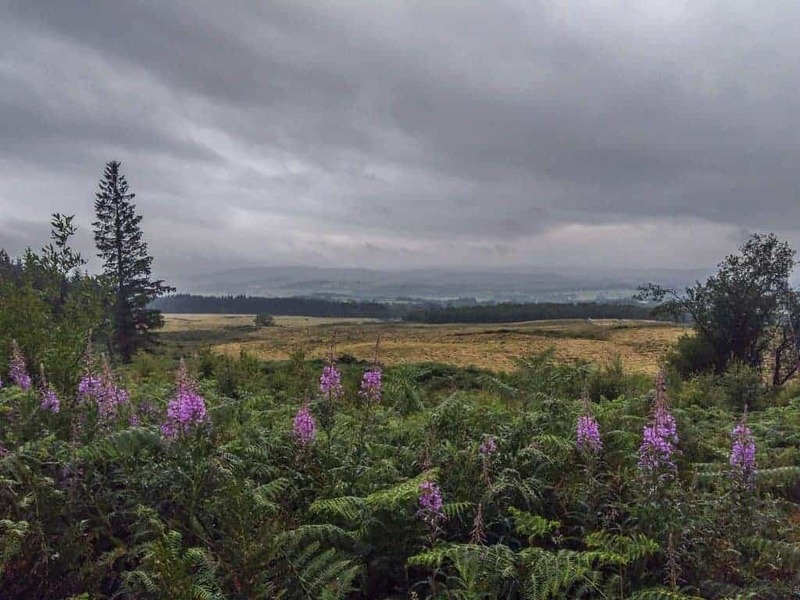 The ride takes approximately 25 minutes and will drop you at the Milngavie train station, located just a short walk from the start of the West Highland Way. There is also frequent service to Milngavie from Glasgow Central Station. The ScotRail website contains schedule information and allows you to purchase tickets ahead of time. To get to the official start of the West Highland Way from the train station, walk through the pedestrian underpass and onto Station Road. Keep straight on Station Road until you reach the pedestrian-only town square in Milngavie. The obelisk marks the start of your West Highland Way adventure! The start of the West Highland Way is a short walk from the train station. 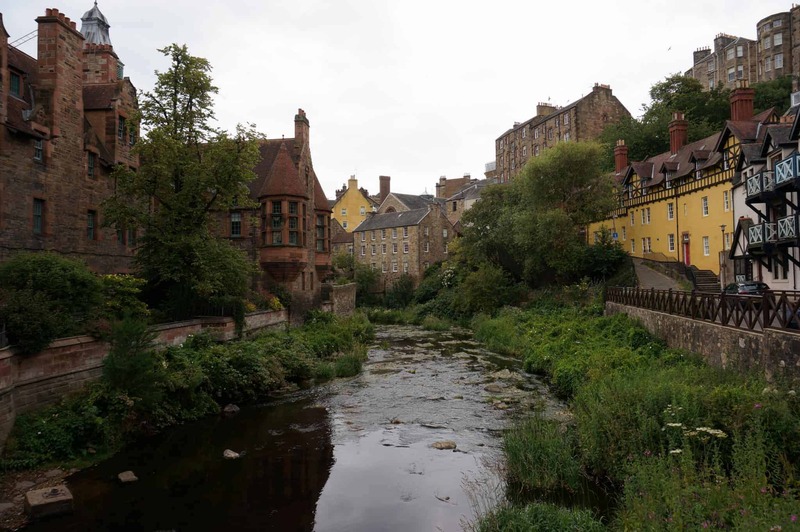 Many walkers may not think of Edinburgh as an option prior to starting the West Highland Way, but we’re here to tell you that it makes a great stop before starting your walk! We flew into Edinburgh and enjoyed a few days in this beautiful city. We can tell you firsthand that it’s a breeze to get to Milngavie from Edinburgh. There are several daily trains from the Edinburgh Waverley Station (the main train station) to Milngavie. The faster option bypasses many of the small towns in between the two cities but involves a transfer at Glasgow Queen Street Station. There is also a direct train between Edinburgh and Milngavie that takes slightly longer, due to making many stops along the way. The benefit of this train is that you won’t have to worry about switching trains with your heavy bags. Tickets are easily purchased for either option at the Edinburgh Waverley Station. We opted for the longer, direct option leaving Edinburgh around 8:30am and arriving in Milngavie by 10am – plenty of time for the first day’s walk to Drymen! Edinburgh is a great city to visit prior to walking the West Highland Way. West Highland Way Apartments – The aptly named West Highland Way Apartments provide an extremely convenient and highly reviewed place to rest up before starting your walk. Premier Inn Milngavie – The Premier Inn is a great budget hotel in Milngavie. You’ll be close to the start of the walk and can fuel up for your first day with their free breakfast. Point A Glasgow – We stayed at the Point A after hiking the West Highland Way and would highly recommend it. This is a great budget option with well-designed rooms and a price that can’t be beat! We’d recommend opting for a room with a window. Motel One Glagow – The Motel One Glasgow gets great reviews for its central location, comfortable beds, and friendly service. The Lane Hotel – Located just over a mile from the city center, the Lane Hotel gets great reviews for its cleanliness and comfort. The Inn Place – For those looking to stay in Edinburgh’s charming Old Town, the Inn Place is a great option. It’s known for its great breakfast and location near to the Royal Mile. Nevis Bank Inn – You’ll find the Nevis Bank Inn at the entrance to Fort William. This 4-star hotel is known for the friendly staff and excellent breakfast. Fort William Backpackers – Fort William’s best hostel is located near the train station and has a variety of room options. The best budget choice in town. Shelbeck Bed & Breakfast – For those looking for the traditional Scottish bed and breakfast experience look no further than the Shelbeck. Very helpful owners in addition to the full English breakfast. There are many different accommodation options available in Milngavie, Glasgow, Edinburgh, and Fort William on Airbnb. You’ll find everything from luxurious row-houses to rooms in a shared house. Airbnb’s often provide a kitchen and laundry facilities, which can be a welcome feature after hiking in the same two smelly outfits and eating instant ramen for the past 8 days! You can get $40 off your first Airbnb stay by registering here. The West Highland Way finishes in the town of Fort William in the Scottish Highlands. Fort William makes for a nice spot to spend the night after completing your walk, and the pedestrian-only main street has plenty of restaurants and pubs where you can celebrate your accomplishment. However, come the next morning you’ll most likely be ready to head back to Glasgow and conclude your West Highland Way walk. Luckily, there are several options for transport back to Glasgow. The most scenic and most popular option is to take the West Highland Railway line which links Fort William with Glasgow’s Queen Street Station in just under 4 hours. This route is popular with tourists and locals alike, so we recommend booking your tickets on the ScotRail website as far in advance as you can. There are several trains per day, allowing for lots of flexibility in your departure and arrival times. The train ride is especially enjoyable for West Highland Way walkers as you will retrace much of the route you’ve just walked. It was quite enjoyable to look out the windows of the train and see walkers and familiar stops from the journey! The other option for your return transport is to take the Scottish Citylink bus service between Fort William and Glasgow’s Buchanan Bus Station. This is the faster (just over 3 hours) and more budget friendly of the two options. While you won’t enjoy the same atmosphere of a Highlands train journey, the bus is efficient and still takes in much of the stunning scenery of the region. You’ll recognize much of the scenery on the train journey from Fort William to Glasgow. Many walkers will be traveling with more luggage than they might like to carry for 8 days on the West Highland Way. If that’s the case for you, you’ll find several options for luggage storage or luggage transfer on your trip. The best place to store your luggage is Glasgow. Both Queen Street Station and Central Station have luggage storage facilities and there are also private companies who will gladly keep your bags safe and secure while you’re on your walk. The Excess Baggage Company is one of the more popular and allows you to reserve your left luggage online ahead of time. If, instead of simply having your luggage waiting for you when you’ve completed your walk, you’d rather have it transferred to each of your nightly destinations, there are plenty of companies who will help. These companies will pick up your bags in the morning and then deliver them to your destination each evening, ensuring that you’ll only ever need to carry a daypack along the Way. Travel-Lite and AMS Scotland are two of the most reputable baggage transfer providers. The best option of course is to only pack what you need and avoid having to store any extra luggage! Tyndrum – Stopping for a day in Tyndrum will allow you to rest up before some of the best Highland walking of the West Highland Way. Tyndrum has a touristy feel, but it has plenty of restaurants and accommodation options to keep you entertained while you’re there. This will also be early enough in your walk that you’ll still have energy to explore some of the surrounding area. 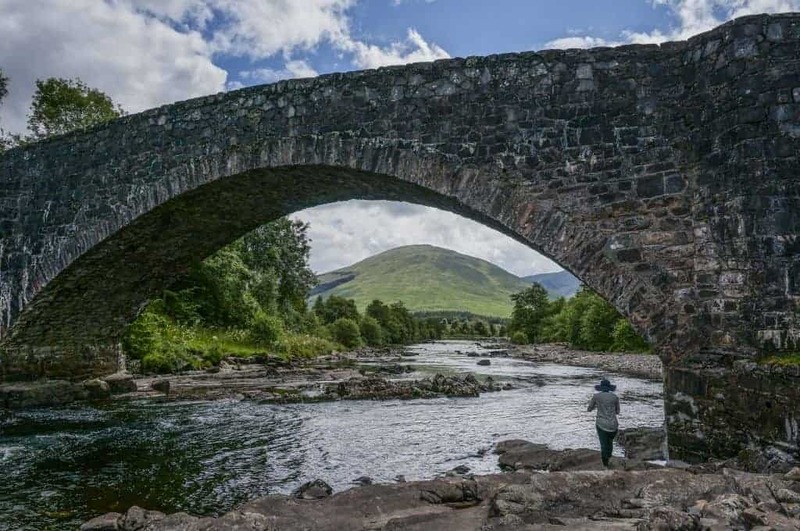 Bridge of Orchy – A rest day at Bridge of Orchy will suit those who are truly looking to stay off their feet for the day. While there won’t be much to do, the beautiful hotel and grounds provide for a relaxing atmosphere before continuing your walk. The hotel bar is a great place for a couple of pints! Glencoe Village (side trip) – Glencoe, one of the best known Highland towns, makes for a great rest day stop. If you take this detour, you’ll get the unique chance to experience a quintessential Scottish mountaineering town. However, given that it’s 9 miles from Kingshouse, you’ll have to to get their by either catching the Citylink bus, hiring a taxi, or arranging for a pick-up with your accommodation. Be sure to check out our entire series on the West Highland Way to learn everything you’ll need to know to prepare for this incredible adventure! Guide to Camping on the West Highland Way – the complete guide! West Highland Way Packing List – Be sure you’ve got everything you need! West Highland Way Photo Gallery – Get inspired! West Highland Way Trip Report – Know what to expect! How to Navigate on the West Highland Way – turn your smartphone into a GPS! How to Find All of Your Campgrounds on the West Highland Way- Downloadable GPS waypoints! How to Train for the West Highland Way – Get in shape for the WHW! How Much it Cost us to Hike the West Highland Way – All the budget info you’ll need! Do you have to reserve the campsites? There are a few campsites that it would be wise to reserve. If you plan on camping at Sallochy along Loch Lomond you’ll definitely want to reserve it ahead of time. Also, if you plan to camp at the MacDonald Hotel in Kinlochleven I would reserve there as well. You can find more details on our West Highland Way Camping Guide page.